The Indian farmer, sadly, features more in grim headlines than in stories of innovation. Historically and traditionally, India has been an agrarian economy, with the sector now contributing 17 percent to the national GDP. Even today, over 58 percent of households depend on it for their livelihood. But drought, poor infrastructure, and lack of dependable labour have resulted in poor yield year after year. One of the biggest challenges is irrigation, especially for small farmers who use drip or sprinkler systems, particularly when water is seen as an increasingly finite and precious resource. Tackling this problem is Bengaluru startup’s Avanijal Agri Automation’s Nikash—an automated irrigation management system that farmers can programme and control using just a smartphone. This innovation has the emotionally vested interest of Channabasappa Kolar, born into an agrarian family and who has seen his community’s heartache as they strive to coax the arid land to yield. His job at Wipro led him to collaborate with his long-term associate, HS Vijayeendra, to find a technology-led solution and the duo founded Avanijal Agri Automation in September 2013. They leveraged their extensive technological experience to design IoT/connectivity technology with which farmers can control the flow of water, even from their homes, using a mobile app. No more trudging to the farm at all sorts of odd hours to switch off the valve or motor. Instead, this innovation enables farmers to easily irrigate or fertigate their land, obviating over- or under-irrigation. Once the irrigation is complete for a given section of the land, Nikash opens the valve for other sections automatically. At the end of the schedule, irrigation stops for the day. This continues daily till the farmer reschedules the programme according to the crop’s needs. The controller supports a wide spectrum of wired and wireless valve/sensor connections and irrigation resolutions: from a few seconds to several hours. “With its help, farmers can irrigate based on time, volume of water or soil moisture. And, if there is a power outage in between, the duration or the volume of water is compensated,” adds Vijayeendra. Avanijal is constantly looking to improve its product technology and Qualcomm is working closely with the venture, providing them with access to both hardware and software resources. 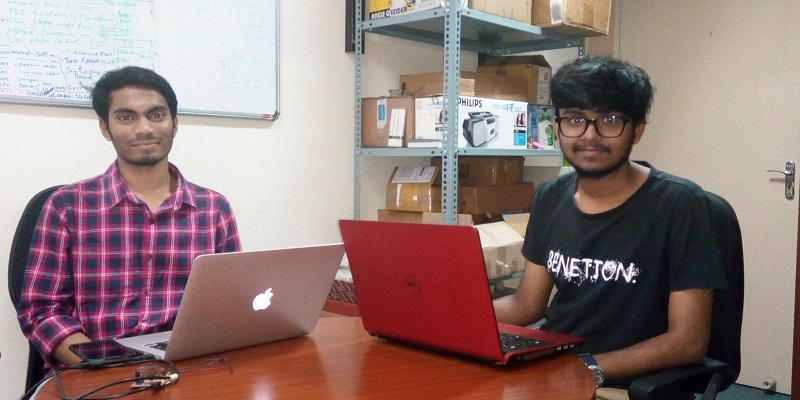 As one of eight shortlisted companies for Cycle 1 of the Qualcomm Design in India Challenge 2017, the duo is leveraging Qualcomm’s BluetoothLE and CSRMesh technology as part of its product and solution. India’s agri-startup market is growing at a rapid pace with the emergence of entities such as AgroStar, Kisan Raja and so on. In such a scenario, Avanijal faces tough competition from both Indian and global brands. He believes that what sets Nikash apart is its affordability. Moreover, he claims, none of the competitors’ products have safety and protection features like voltage monitoring, and motor and valve protection, pipeline protection and the like. “Our controllers work on both three-phase AC from mains with a wide voltage range of 175V to 575V or on generators. They also work on DC from a solar panel with voltage ranging from 250V to 500V. Another key and frugal innovation feature is that up to four farmers with adjacent land can share the same controller and this can bring down the cost of ownership further,” he explains.